The purpose of the Alumni Recruitment Club is to extend the recruitment reach of the University of Hawai’i Mānoa, across geographic areas, with our distinguished alumni by promoting an accurate and positive view of UH throughout Hawai’i, the U.S. continent, internationally, and especially in the areas that recruitment counselors cannot reach. Share your pride and inspire future Rainbow Warriors to apply to UH and encouraging our admitted Bows to enroll. Your enthusiasm and first-hand knowledge of the college experience will have a great influence on our prospective students and their families. The Office of Admissions along with UH Foundation Office of Alumni Relations will oversee the club and provide both training and materials needed to successfully recruit your alma matter. Did you know 30% of first-year students do not return to UH Mānoa at the end of each academic year? But if students feel supported and connected with the university, they are more likely to stay. We are looking for alumni volunteers who are willing to “hānai” one or more UH Mānoa students – to serve as mentors and help kick-start their Hawai’i network. Your support of this program for our first-year students will help make Mānoa feel like home. It’s a minimal time commitment – just meet with your student(s) at least once a month. Join a network of fellow UH parents! We are here to help you connect with other parents of UH students, so you can share your experiences and support each other as your kids start college. 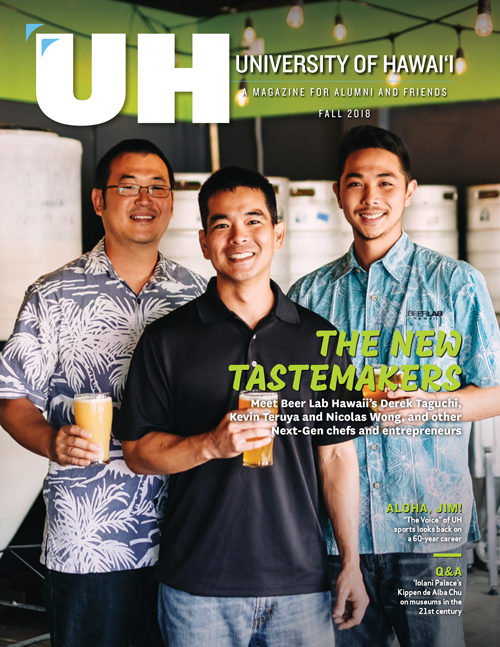 Receive the UH Mānoa alumni e-newsletter and learn about on-campus resources, as well as local and regional UH alumni networking events. The UH Homestay Aloha program seeks to recruit UH alumni and community members to serve as homestay hosts for UH health sciences students that are training on different islands from where they live. Data shows that exposing students to new training sites increases the likelihood that they will practice there. However, expensive housing is currently a barrier to UH health sciences students doing rotations on other islands. UH alumni volunteers have been attracted to the UH Homestay Aloha program since it gives them an opportunity to give back to their alma mater in a meaningful way. By opening up their homes and sharing their personal experiences with current UH health sciences students, UH alumni and community volunteers can form long-term relationships with students and invest in our future health workforce. Welcome and share your experiences and nostalgia with students and parents, and reconnect with fellow alumni at gatherings. Be an ambassador and advocate for the university while connecting with constituents. Activities range from helping with setup or cleanup, greeting and checking in attendees at registration, or helping to promote an event via social media to your outlet and personal network of local alumni. Providing geographic feedback on venue selection, times, or any conflicting events in the area. Share the wonderful ways the university is impacting lives! Stay informed on ways you can take action in support of UH. Sign up for our advocacy alerts by completing the volunteer form. Register to vote. Help select the people who make the decisions for our state. Find out who represents you on the state level. As your state senators and state representatives, they will be particularly interested in your thoughts about legislation they are working on.